The symposium will take placed during three days: 16th, 17th and 18th of November at Posthallen, the former post office headquarters in Oslo, and will centre on a discussion of four case studies of singular artworks by Mette Edvardsen (Norway), Dora García (Spain), Thomas Hirschhorn (Switzerland) and Rahraw Omarzad (Afghanistan). Each of the four works will be analysed and debated via three different formulae: conference plenary sessions, workshops and one-to-one conversations. In the plenary sessions, the artists themselves and a range of specialised speakers from different backgrounds and fields of expertise will hold a broad-based debate. Specially formatted workshops will host smaller groups and examine specific aspects of each case in depth. In one-to-one meetings, attendees will have the opportunity to engage in conversations with the artists and speakers directly, and approach the works in a more personal way. The three figures included in the title—the Giver, the Guest and the Ghost—announce a discussion about the changing conditions, positions and potentials of the work of art in public space. These figures will act as guides in a discussion of the variable roles of the agencies and actors involved in public art practices. The Giver reflects an idea of art as a form of contribution or opportunity offered to the public, questioning the roles of giver and receiver, and the role played by the artist in such a model. The Guest reflects the idea of the artwork as partially independent from the site and context it inhabits; what responsibility—if any—lies with the guest? The Ghost points to the unmanifested presences and shadows that surround the artwork. What follows in the footsteps of the artwork and what is left behind when the artwork disappears, either physically, or because it becomes obsolete, irrelevant, or normalized? 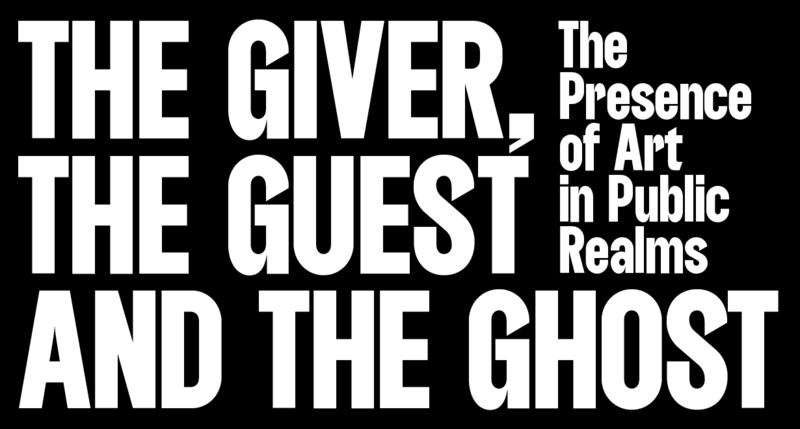 The Giver, the Guest and the Ghost will investigate the selected works of art through a qualitative analysis of different time frames: how a work operates over a short period, in the long term, or as a work in progress. From experience comes knowledge, and so the works will be discussed via these different formulae so that the audience can take part in diverse experiences and exchanges of knowledge. As an interpretative form of research, the symposium intends to examine and consider the details of meaning and experience, rather than to postulate a series of hypotheses a priori. In this way, we hope to generate a range of pertinent and enriching insights through the detailed examination and contextualization of these four cases. This is a free event, and will be held in English. OSLO PILOT is a two-year research-based project investigating the role of art in and for the public realm. Developed by curators Eva González-Sancho and Per Gunnar Eeg-Tverbakk in order to lay the groundwork for a future art biennial. OSLO PILOT is initiated and financed by the City of Oslo, Agency for Cultural Affairs, Norway. Further funding is generously provided by Norsk kulturråd, KORO, the Royal Norwegian Consulate General in New York, the Royal Norwegian Embassy in London, the Royal Norwegian Embassy in The Hague, and the Royal Norwegian Embassy in Paris. For a PDF version of the programme, please click here. For the full version of the the programme, please click here. Join us for a drink and register in advance. You can pick up all the information you will need for the symposium, including the programme and information about the speakers. If you haven’t already signed up for workshops via the online form, you can do so at this time. Please note that two of the workshops will take place just down the street at OSLO PILOT’s Project Space, Prinsens gate 2. Check the individual listings for location. Check in and pick up your symposium folder, which contains the programme and information about the speakers. If you haven’t already signed up for workshops through the online form, you can do so at this time. Coffee and tea will be available all day. The same workshops are offered in both session 1 and 2 (see below), giving you the opportunity to attend more than one. If you haven’t pre-registered for these workshops online, visit the registration desk to sign up. There are a limited number of seats, so please reserve your place in advance. If you haven’t pre-registered for these workshops, visit the registration desk to sign up. There are a limited number of seats, so please reserve your place in advance. If you haven’t checked in already, please do at this time, and pick up your symposium folder, which contains the programme and information about the speakers. You will also be able to sign up for workshops and one-to-one meetings. Coffee and tea will be available all day. There are a limited number of one-to-one meetings available, and limited space in the workshops. If you would like a one-to-one meeting or to attend one of these workshops, please visit the registration desk to sign up. If you haven’t checked in already, please do at this time and pick up your symposium folder, which contains the programme and information about the speakers. You will also be able to sign up for one-to-one meetings at this time. Coffee and tea will be available all day. There are a limited number of one-to-one meetings available. If you would like to sign up, please visit the registration desk.